Neary 4 months old and I can’t believe Jameson is ours–they let us take him home from the hospital? Amazing. But here he is and I’m finding out it’s not as easy as 1-2-3 to raise a happy, healthy baby. So many questions, and, in the advent of technology, so many paths to a supposed answer. Call this number, press 1, then 4, then hold for 10 minutes. The latest issue? 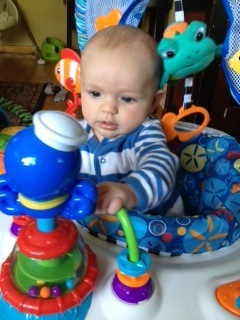 Disney’s Baby Einstein Neptune Exersaucer. It looked perfect: ocean theme, matches his activity mat that he loves and it’s Disney—a favorite of mine. That was until my wife pulled it out of the box to assemble. Among the what-seemed-like 100 parts, was a book of instructions—or so we thought. I open to find numbers on diagrams with arrows pointing every which way. For someone with a disability such as mine that affects the hand muscles and dexterity, it spelled nightmare. For someone with less-than-stellar ability to look at pictures and translate to assembly, like the wife, it also spelled nightmare. We sat on the ground, pieces splayed before us, son in his swing, hoping we would be done before his nap ended. Slowly, but surely, we pieced it together, but it was far from easy, and “some assembly” should have said “all assembly.” My fingers couldn’t work the small parts, so while I read and translated, she assembled. I had her put one piece in the wrong slot and it took 20 minutes and a flat-head screwdriver to remove said piece and place it in its right home. In the end, Jameson loved it, but these moms might think twice about buying anything from Disney again. This entry was posted in disabled moms, first time moms, parenting, Uncategorized and tagged Baby Einstein, Disabled Mom, Disney, First time mom, Neptune. Bookmark the permalink.